The Woodhorn Link – The Benefits and 2 Million to Woodhorn Museum? With our proposals for a revived railway at Butterwell steadily advancing, with plans currently being developed on how to begin in a technical sense, thoughts always have to remain in how visitors will arrive and what will attract them to visit. With our scheme for a ‘heritage’ type railway operating vintage locomotives and rolling stock to portray the areas’ rich railway heritage, in some cases on the very lines on which they once worked, we hope to attract both enthusiasts and families to visit, preserving a little more of the past for future generations to enjoy. There are a number of other heritage railways & sites both nearby and further afield; such as the Aln Valley Railway, Beamish Museum, Bowes Railway, South Tynedale Railway, Stephenson Railway Museum and the Tanfield Railway to name but a few. We hope that our scheme would be a valuable addition to these existing schemes, and hope to work closely with them. Some of these railways are already home to working, restored and unrestored items from the area, for example Barclay 615 at the Aln Valley Railway was built new for the NCB at Bates Colliery in Blyth, or NER 3071 at Beamish which is one of the wooden carriages bought used by the NCB for the passenger trains on the branch, and has now restored to its original condition by Beamish Museum. Our initial plans focus upon borrowing working locomotives/rolling stock either for short or long term use through a hire/lease agreement or suchlike, with a longer term consideration to supporting or carrying out restoration of as yet unrestored items. While we hope, like the other sites mentioned that this would prove to be a highly popular attraction of its own accord, we are lucky to be reasonably close to two other attractions, which has led us to investigating our options for connection. Building upon our previous ‘More on the Woodhorn Link’ post and from our discussion at our AGM earlier this month with members from the Woodhorn Narrow Gauge Railway, the closeness of both the existing NG Railway and the Museum itself, present great opportunities. From the discussions with Woodhorn NG railway representatives at our recent AGM, the existing visitor numbers at their site was discussed, with about 100 thousand people on average visiting Woodhorn Museum per year; this being borne out by the Millionth Visitor expected post on their website earlier this year, 10 years since the site re-opened after a major refurbishment. The Narrow Gauge Railway sees about 20% of this figure (around 20,000 per annum). Taking those figures, it can be seen that about 20,000 people per year take a train ride from the Musuem to the Lakeside or vice versa. It could then be reasonably assumed that if the line was longer, many of these visitors would happily extend their journey to a connection with our standard gauge project, giving us access to an interested group of people quite readily. Two options for a potential connection were discussed at the meeting, the first, as outlined above would see an extension to the existing line from Lakeside Halt (very close to the Woodhorn Grange pub/hotel), before running almost directly west to reach our start point at New Moor, as indicated on our map above, or from the museum along a more southerly course just to the north of Ashington to our Hirst terminus. 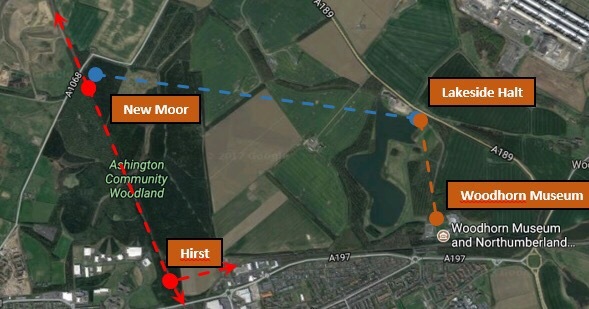 The first option presents perhaps the best opportunity, as the ABTRA proposal is to start at New Moor and extend southwards, and a connection here would provide transport connections from the outset of our project. This would also provide two major car parking areas en-route to New Moor, with both the museum and Lakeside car parks on the route, as well as making best use of the existing line between these two sites. One aspect is the potential need to cross the car park at Lakeside, however, this is considerably less complex in our view than what was achieved by the Ffestiniog and Welsh Highland Railways’ Portmadog road crossing, which involves a short stretch of street running, as can be seen in the first two minutes of this YouTube clip. We would intend to provide a more conventional level crossing within the car park, but this clip shows what is technically feasible. Returning to potential visitors, we envisage that this extension would appeal to the majority of existing visitors, taking perhaps a figure of 50% of existing users would still give a ridership/potential visitor potential of around 10,000 per year. True ridership could be much higher, indeed with an easy connection between two complementary sites (Woodhorn Museum and the Butterwell Branch), we hope that many more would take the opportunity to visit both sites together. Looking back to the millionth visitor by the tenth year of re-opening the museum, perhaps with an increase in visitor numbers the museum could hit 2 million visitors earlier than 20 years? As a group we are continuing to assess the feasability of our plans and will continue to work with the Woodhorn Narrow Gauge Railway and in time Woodhorn Museum on our proposals. We will post more news as this becomes available. Previous £191 Million for Ashington, Blyth and Tyne Re-opening? Next Ashington No. 38 (Big 38) on coal train duty.